Android Phone Stuck on Boot Screen, How to Fix? What to do if Android phone gets stuck on boot screen or cannot turn on? Well, there are several possible reasons that causes the Android stuck on boot screen issue, including the incompatible third-party software, system crash for root Android, hardware damage and etc. 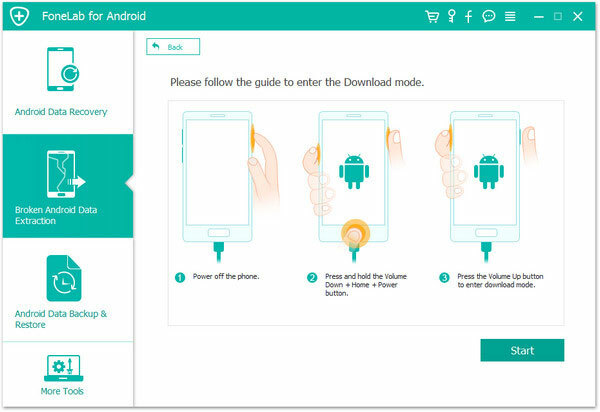 But please don't worry, simply follow the user guide in this article to solve Android stuck on boot screen issue with ease now. When your Android phone gets in trouble, the first thing to do should be to save the important data from your Android phone. Since the Android phone cannot turn on properly, it is kind of hard to export the data from Android phone for backup using the common ways. 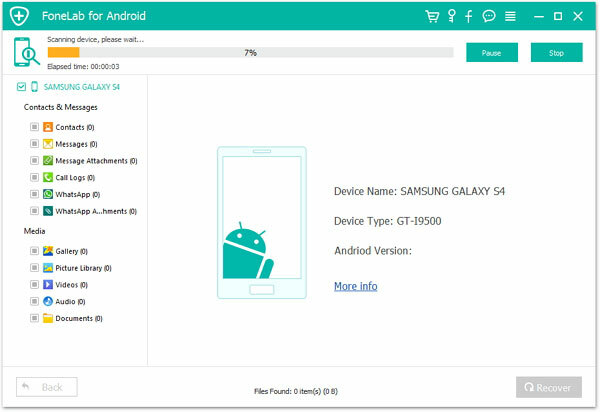 So it is kindly recommended a professional Android Data Recovery tool - Broken Android Data Extraction to help you rescue your data from Android phone with broken screen. With it, you can easily restore any Android data totally by yourself, including the photos, videos, contacts, SMS, music, apps, call logs, audio, WhatsApp data, documents and etc. And it will recover the Android data in original, damage-free and unmodified form on all Android devices, such as Samsung, Huawei, LG, HTC, Sony, Motorola, ZTE, OPPO and etc. Note: To recover contacts or text messages from Android phone, you need to root your Android phone at first. Step 1. Download, install and launch the Broken Android Data Extraction program on your computer, and connect your Android phone to computer with a USB cable, then the program will automatically detect your device immediately. Step 2. Click "Broken Android Phone Data Extraction" one the left panel and click the "Start" button. 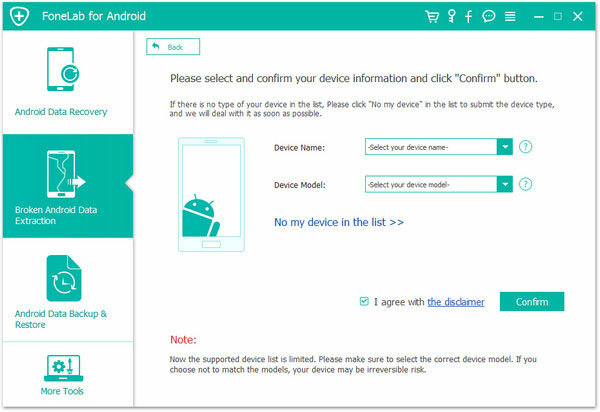 Then, choose your phone's name and model and hit "Confirm" option. Step 3. Now please put your Android phone to Download Mode. 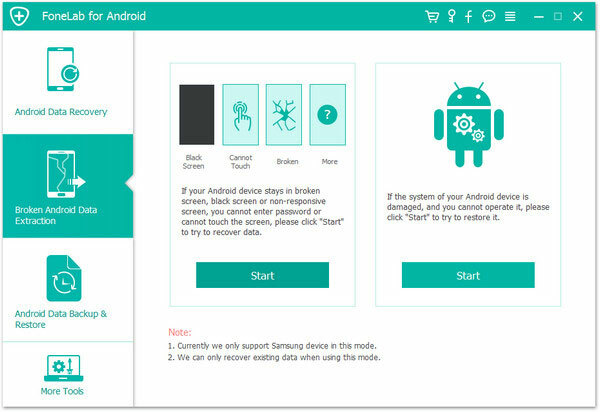 Simply follow the screen to do it and then click "Start" button to fix your Android phone. Step 4. Finishing the above operations, the program will automatically scan and show your Android data in different categories. Just check the box before the file types you want to restore, and hit "Recover" button to start recovering data from Android with endless boot screen and save them on your computer immediately. See Also: How to Backup Android Tablet on Computer? To fix Android stuck on boot screen issue, it is advised to put your Android phone into Recovery Mode to restore your Android to factory settings. Here, please be noted that this will wipe out all data and settings on your Android phone and make your Android device back to factory default settings. But you can also recover Android data after factory reset, too. Step 1. On your Android phone, please press and hold the Volume Down and Power button and Home button at the same time, and release the three buttons when screen is on and wait to enter Recovery Mode. Step 2. When Android enters Recovery Mode, please press Volume Down button to choose the "wipe data/factory reset" option on your device, and then press the Power button to confirm your choice. Step 3. Then choose "yes, delete all user data" option using the Volume Down button, and press Power button to confirm your action. Step 4. Then select "wipe cache partition" option using the Volume Up/Down buttons and press Power button to confirm. Step 5. Wait for a while till the next screen shows up, and choose "reboot system now" option and press Power button to restart your phone. Step 6. Wait and your Android phone will be restarted soon. Now your Android phone's endless boot screen issue should be fixed and you can set up your Android phone as a new one now.